Just as I predicted I would when I wrote my review for the Bangles concert I attended last year, I ventured back to that very same downtown Seattle venue (The Showbox at The Market) for yet another show. And also as tradition would dictate, it would be for yet another fabulous pop band from yesteryear: The Psychedelic Furs. I must've grown a thicker skin since I was down there the last time, by the way; I wasn't even remotely as freaked out by downtown Seattle at night as I was then. ...Of course, it still gave me the willies, but it wasn't enough to do much more than make my heart race 1,000 beats per minute and make my eyes constantly dart around the shadows on the lookout for lurking, suspicious people. I continue to be horrible at timing, as I arrived a full hour early before the doors opened. However, this too has managed to improve significantly from last year when I showed up to the venue a ridiculous two-and-a-half hours early. Since I had some time to kill, I walked up and down First Street (which is the premiere place to be trendy in Seattle) and amused myself by glancing inside all the shops. Among them, there were art galleries, art galleries that were also coffee shops, coffee shops that were not art galleries, the original Starbucks (not an art gallery), and a new-agey place that sold about a billion varieties of tea with odd names. (I wonder what would happen to me if I went in there and asked for a bottle of Lipton's iced tea?) The most notable thing about these shops was that I passed by TWO--count 'em--TWO places that sold rugs. I guess if you're in downtown Seattle looking for rugs, you wouldn't have much trouble finding a place. While I was walking down this sidewalk, I did try my best to avoid any area that wasn't well-lit. But I couldn't completely do that unless I were to walk in circles underneath a street lamp. Thus, it was only inevitable that every so often I'd pass through a patch of shady area, which would sometimes be populated with people loitering. Nothing usually happened to me except for one thing. I saw a large man in the shadows who was holding up something at me. An irrational thought flashed through my mind that it was a handgun. However, the rational part of my brain pointed out there was only a minuscule chance that some random person would randomly point a gun at another random person walking down a random sidewalk in public. However, just in case my paranoid heart was correct, I walked faster so that I could get underneath a street lamp as quickly as possible. (I'm not really sure what good walking underneath a street lamp would have done. Other than to, perhaps, get witnesses.) However, as I walked past this man, I was able to look at this object more closely and noticed that he was, in fact, holding up a smart phone. The expected gush of relief washed over me. But then something weird happened. I found myself looking at this man dead in his eyes, and he returned it back to me with the most horrific death-glare that I ever could have imagined. Given the shape and size of this guy's face and the bugged-out nature of his eyes, I'm willing to attribute much of that to his natural look. ...However, I could have sworn I'd also heard him growling a bit. 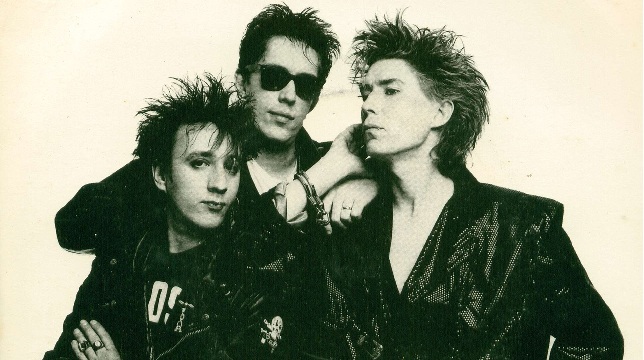 The one thing to note about The Psychedelic Furs was that they were an extremely trendy act at one point, and lead singer Richard Butler was kind of a tattered heartthrob. This was probably why the floor was populated mainly with 40- to 50-year old women. (Yes, I do feel a little odd going to the same shows as 40- to 50-year-old women. However, I get over that pretty quickly!) There were people representing other demographics there, too, so I didn't feel especially out-of-place. ...I was, of course, either not-born or a snotty toddler when The Psychedelic Furs were in their heyday, and it wouldn't have been until 2004, or thereabouts, I'd first come to know their work. I remember spotting a used copy of their debut at a store and picking it up. I listened to it a few times then, but to be honest, it took me a few years before I'd let myself become fully basked in its glory. However, I think the one Psychedelic Furs song that has connected with me the most was a song off their lone album from the '90s, "Until She Comes," which I must've played it to myself five dozen times. ...If there was one song I had been hoping they would get around to playing, it would have been that one. They concentrated very strongly on material from their 1982 album Forever Now. While I wasn't quite as familiar with that album as the debut, how could I ever complain that I heard a bunch of songs from that? I'm also pretty sure it was the album people in the audience wanted to hear the most, since those songs tended to garner the strongest reactions from people. That is except for what's probably their most popular song ever: “Pretty in Pink,” which was from Talk Talk Talk. The Psychedelic Furs were so devoted to playing songs from Forever Now that they even constituted the first three songs of their setlist: "Only You and I," "Love My Way," and "Run and Run." They're all excellent, but "Love My Way" stands out more than anything else. It's been weeks after the show, now, but that song continues to be stuck in my mind. The band itself consisted of no original members apart from lead singer Richard Butler and his brother Tim, the bassist. Otherwise, there was a younger guy named Richard Good who played lead guitar, Paul Garisto on drums, Amanda Kramer on keyboards (who was a former member of The Information Society and World Party), and Mars Williams on saxophone. Now, the saxophone player turned out to be an integral part of the band's stage sound. One thing I knew before going to this concert (and absolutely the #1 reason I was excited about going to this) was that there would be a lot of noise there. When I say noise, I mean walls of heavy, blaring noise, all set to danceable beats. And that was exactly what I got: Ugly, fuzz guitar, raucous bass rhythms, and those characteristic, reptilian, raspy lead vocals from Richard Butler. However, the blaring aspects of their songs weren't the results of the guitar, which was what I had been anticipating: that was coming from the saxophone. It not only made most of these songs loud, but they lent them a kind of tangy flavor. Even listening to their original songs, I'm not even sure a saxophone was present. Or at least I couldn't hear it that well. Williams was quite a spirited saxophonist, too: His face was red from all that tooting, and yet somehow he also found the time to dance around quite a bit. I mean, seriously, if I tried that, I'd be worried of suffering an aneurysm. Richard Butler also looked like he was having a blast. He was in his late '50s and looked the age, but he didn't act like it. Whatever mannerisms you've seen from him in his music videos he reproduced on stage as though nothing had ever changed. (Some of his signature moves: Resting his head on the microphone stand while grinning widely and insolently; leaning over the stage with his neck sticking out, scream-singing at people; walking across the stage wiggling his head from side to side as though his neck were a spring; occasionally bowing as though he were some kind of regal jester; I also enjoyed his elaborate mock marching and saluting during the especially raucous performance of "President Gas"). He wore black-rimmed glasses that magnified his eyes a bit, and his eyes would slit whenever he smiled. His voice was of course never a pretty thing... But it always seems to be the ugliest voices that age well with time. So, he sounded pretty much the same as he did in the original songs. There was also Tim Butler who was usually there to occupy the center stage whenever Richard wandered away from it for whatever reason. Tim didn't have a microphone with him, but he was nonetheless mouthing along with all the songs, which I'm sure most people that he was looking at in the crowd were also doing. The space I was occupying on that floor was not terribly valuable when I first stood there that evening, but it was prime property the longer the night went on. (This is why it was so important to buy land before the big cities moved in. ...There's some advice just in case you find yourself loaded with a pocketful of change in 19th Century America.) The space around me on that floor was so coveted that I was even witness to one or two heated shoving matches nearby. Throughout much of the show, I was standing next to a 40-ish woman who was about 5'2” who I'd dubbed Minnie Mouse. Out of nowhere, someone shoved this woman into me. The person who did the shoving turned out to be a six-foot woman who was 50-ish and had a permed, poofy head of gray hair. I dubbed her Big Bertha. (Thank goodness my feet was very well planted on the floor at that moment, despite my desperately aching knees, or I would surely would have toppled over.) My immediate thought was that Big Bertha needed to get to the front of the stage to deliver a piece of dire news to a friend standing up there. However, it turned out I was giving her too much credit for dignity; she immediately had her hands raised up toward Richard Butler and started dancing along with the rest of the people up there. She'd managed to wedge herself directly in front of the people who were wedged directly in front of me, and I saw them choking on her poofy hair. One of them gave up and said "Well, I need to go to the bathroom, anyway," and so they left. However, Minnie's view of the front stage was obstructed by this behemoth, and she was fuming. Minnie marched right up to Big Bertha, and gave her a hip check that seemed to defy physics. Big Bertha stumbled out of the space and shook her head with dopey-eyed disbelief. She tried to wedge herself back into her old spot, but this only resulted in Minnie doing another massive hip-check. That time, it nearly knocked Big Bertha over. The next thing I knew, these two were face to face in a showdown. This was a brief but intense moment that I thought, for sure, was going result in an all-out cougar-fight. Minnie Mouse definitely seemed raring to go, but I guess Big Bertha wasn't. A look of lowly defeat permeated in her deflated eyes, and she retreated to the back of the crowd. She tried to drum up some support and sympathy from people around her along the way, but she got nothing. So anyway, this was what the Psychedelic Furs concert was like. And once again, I seem to have written far more than I needed to. (Though perhaps I'm getting better in these regards? Looks like I stuck to only three pages!) To close, I absolutely would recommend going to see these guys if you ever get the chance. I'd recommend that even if you don't know their material so well. I mean, their songs are NOISY and infectiously danceable, and they definitely played their hearts out. Really, there's not much that could go wrong with that.